The Florida East Coast Railway (FEC) Fort Pierce Station in Fort Pierce, Florida, in the 1900s. The Fort Pierce train station was located along the tracks that now run through downtown Fort Pierce, Florida. Henry Flagler expanded his railroad down the Florida east coast from Jacksonville in 1894, forever transforming the economic development of Florida. 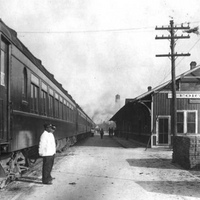 In 1911, Fort Pierce was established as a division point for the Florida East Coast Railway Company. This new and efficient form of transportation began to take the place of coastal and canal transportation such as cargo shipping and commuter travel and significantly developed the connection between northern markets and southern products. Citrus, sugar, and pineapple farmers and fishermen located on the coast established packinghouses near the station. It also affected the population growth of these areas, as passengers found it easier, faster and more comfortable to travel further south. New employment opportunities also drew in a heavy population, rapidly expanding the agricultural economy of Fort Pierce, which economically benefited immensely from this expansion. The original Fort Pierce train station was torn down and replaced in 1967. A replica of the old depot is located at the entrance of the St. Lucie County Regional History Center building and also houses the "Train Station Room," which includes dioramas, models, murals and photographs of historic Fort Pierce. Digital reproduction of original 8 x 10 inch black and white photoprint: Print Collections, image number PR00824, Florida Photographic Collection, State Library and Archives of Florida, Tallahassee, Florida. Original 8 x 10 inch black and white photoprint: Print Collections, image number PR00824, Florida Photographic Collection, State Library and Archives of Florida, Tallahassee, Florida. Print Collections, Florida Photographic Collection, State Library and Archives of Florida, Tallahassee, Florida. Copyright to this resource is held by the State Library and Archives of Florida and is provided here by RICHES of Central Florida for educational purposes only. "History." Florida East Coast Railway. http://fecrwy.com/about/history. Bramson, Seth. Speedway to Sunshine: The Story of the Florida East Coast Railway. Erin, ON: Boston Mills Press, 2003. "The Train Station Room." St. Lucie County Government. https://www.stlucieco.gov/history/train_station.htm. 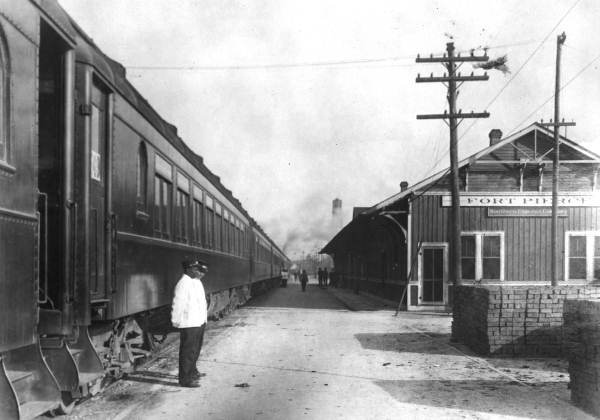 “Florida East Coast Railway Fort Pierce Station.” RICHES of Central Florida accessed April 18, 2019, https://richesmi.cah.ucf.edu/omeka/items/show/5130.